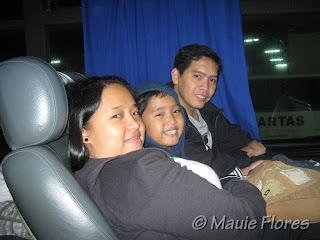 The first day of our short Bohol trip last January 29 to 31 started with our Panglao Island tour. We arrived in Tagbilaran City around 10 in the morning and, after having a quick but yummy lunch at El Portal Inn where we were billeted, our van arrived at 11 in the morning. From Tagbilaran City, our driver slash tour guide drove for twenty minutes to the island of Panglao. Our van crossed the bridge that connected the island to the mainland. We were informed that there was no bridge yet a few years back. The only way to reach Panglao was to ride boats. Hinagdanan Cave in Dauis, Panglao was our first stop. 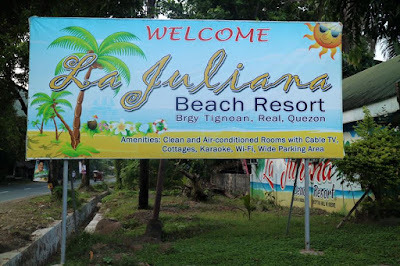 This destination is maintained by the provincial government of Bohol. After paying Php 15 per person for the entrance fees plus another Php 15 parking fee, I was given tickets that looked like postage stamps. Then, we proceeded to the entrance of the cave where we were greeted by our guide, Norman. Hinagdanan Cave was named as such because of the flight of steps (hagdan) that brings visitors down into the cave. The cave was a haven to the swiftlets or balinsasayaw birds. These birds build their nest between the crevices of the cave and their nests are prized as they are the main ingredients in making Bird's Nest or Nido Soup. As Norman toured us inside the cave, he pointed towards the different formations that looked like significant forms from afar. For instance, there was a group of rocks that looked like the Holy Family. We were very careful walking inside the cave as the floors is slippery because of the moisture. During high tide, the cave's floor also becomes covered with water from the pool. See the white spots on the water? Those are bird poop, lol! It was so tempting to take a dip into the clear waters of the pool inside the cave if it were not for the bird droppings that I saw floating above it. Apparently, the water can be as deep as ten feet but we still saw the floor underneath. Norman was the one who took all these shots. Surprisingly, our tour guide is a trained photographer! He related that they were trained to take shots inside the dimly lit Hinagdanan Cave that's why he knew the ISO, aperture, and shutter speed settings to use. I was lucky that I didn't have to tinker with my Nikon before handing it over to him. Plus, I get to be in the shots! Before heading out of the cave and up to ground level, Norman showed us some paintings that were drawn on one side of the cave by the entrance. He told us that the paintings were not ancient and that they were painted there as part of the set of a foreign movie that was shot inside the cave a couple of years ago. Hinagdanan Cave is a well-kept tourism spot in Panglao Island, Bohol. Tourist guides are more than willing to show guests around to tell them bits and pieces of the history of the place and to take souvenir photos of them as well. Although tips are unnecessary, we gave Norman a little tip for a job well done! Souvenir shops are strategically placed around the site's parking area. We did not buy pasalubong from there yet since it was still our first day. Nevertheless, I think the prices here are within the normal price range of souvenir items compared to those sold in the Chocolate Hills Complex. Hinagdanan Cave is located at Bingag, Dauis, Panglao Island, Bohol. To go there, tourists can rent a tricycle from Tagbilaran City (mainland) or take a cab. It would be best if you visit Hinagdanan Cave as part of a van rental package. We got ours for Php 2,200 for 6 hours. Did you like my post? CLICK THIS to receive my recent travel posts in your email inbox. Tried Nido soup last year from like http://www.geocities.jp/hongkong_bird_nest/index_e.htm . Tastes really good… yeah, I thought it was gross at first, but wow, you won’t regret it. The area inside the cave is really small. Actually, even with the photo ops and all, we just stayed here for under an hour. Kung hindi machika ang tour guide, I bet less than 30 minutes pa.
Hi! The tours that we took were pre-arranged by El Portal Inn where we were billeted. I think you may also coordinate with your hotel about these package tours. .